My daughter, Lisa (not her real name) is in eighth grade. Lisa is a pretty girl. She’s tall, lanky, has big green eyes and has beautiful long blonde hair. We’re from California and the kids in her private school there were trendy but neat, clean, and looked put-together. Lisa (and her older sisters) wore uniforms and the school had rules about how the uniforms had to be ironed, tucked in, clean, and in good condition. Uniforms helped keep the kids focused on their school work. They had zero tolerance for bullying. They weren’t allowed to chew gum! When my husband and I saw your column about having cell-phone free zones at school, we remembered that Lisa wasn’t allowed to have a cell phone at her former school. Now she has it 24/7 and she’s a bully. She uses her phone to take pictures of well-dressed kids and then mocks them on Facebook. We grounded her from her phone, but we can’t do that forever. She says this is stupid. Lisa gets mad when I tell her something doesn’t match, is too tight or revealing. When I ask why she doesn’t care about her appearance, she replies with a stern look. No one can “make” anyone do anything; however, you should take Lisa’s phone away from usage at school, at least until she understands she’s bullying. A phone is a privilege, not an entitlement. We applaud your desires to make the world a better place. You’re intelligent enough to know it’s best to have a world without war and a place where people care the most about each others’ hearts more than “stuff.” These are mature and wonderful dreams for you to work on. But, you may not bully others you don’t agree with because they don’t agree with you. Do you know bullying is against the law? It’s human nature to use our aesthetic, artistic, and visual instincts to decide how we feel about what we see. In fact, visual impressions used to be made by people within 20 seconds! Today, in our harsh and judgmental culture, it’s takes only eight seconds to be criticized on our socio-economic, religious, intellectual, popularity, values, talents, virtue, behavior, and vulnerability. So, if you care enough about you and your life to create a visually pleasing environment and presentation of yourself, you will give off your true compassion and passion to help others do good-hearted things too. You’ll be a strong and authentic leader that others will admire … instead of being a distraction of a hot mess. Don’t betray yourself by being consumed with how everyone else “should” understand what matters most according to you. Don’t betray yourself by being bitter and bullying those who don’t agree with you. Be responsible with your cell phone or your parents should take away your phone “forever.” It’s not an entitlement, it’s a privilege. Being a bully is probably not how you envision yourself. If you know what matters most, live it and show it in your appearance and behavior. You’ll make life more beautiful for yourself and others around you. BTW: Chewing gum is distracting and looks careless. Your last column was about how kids should report bullying to an adult until something is done. You went so far as to suggest that the victims should go to the police if a “trusted” adult doesn’t do anything. One – The teacher, principal or someone from the school has a nice sit-down “talk” with the victim and the bully, and hopefully the parents. However, that usually causes the victim to be double-bullied. Once for whatever the original reason might have been. Then they are double-bullied for being a tattle-tale. Two – The bully becomes more aggressive, especially because the bully gets more of an audience when the victim reports the bullying. Even teachers will gossip about how the victim just wants attention and drama. The bottom line is “report – report – report” doesn’t work. It causes more problems for the victim. Our culture has to change. Carriage – Having tall stature and strong, yet graceful, demeanor in the way we carry our bodies. Our society needs to wake up and see the harm that rudeness, gossip, bickering, one-upping and vicious “just kidding” is causing. Real relationships with real goodness and real care needs to replace the fake identities that come with social media. As child advocates, we have asked our communities to seriously consider keeping cell phones out of schools where most of the mentioned harm takes place. We do not normally mention a product, however, this is the only one we know about that does a remarkable thing … “Yondr” blocks the usage of cell phones. Why is that important? Cell phone usage by students has become a compulsive habit for most users. Cell phones have replaced real relationships and created more damage than the benefit they are meant to be. Kids and teens are not learning how to build communication and relationships. In a school setting, smart phones have often become a crutch, an “invisibility cloak,” a deterrent to meaningful relationships and decent, caring, and purposeful communication. We talked with the CEO of Yondr, Graham Dugoni, for a recent podcast and his phone blocking system is already used at concerts, comedy shows, performances fashioning phone-free zones to maintain authenticity, privacy, and a non-distracting environment. We think this is the perfect answer for education to thrive and for students to experience real life in a good environment. So, our answer to bullying, which is known to incite suicide, depression, anxiety, and much more destruction to our children, is creating healthy and real relationships. Healthy relationships matter the most. This has to be done without a crutch like phones. Phones must not be used as a weapon to bully any one any more. 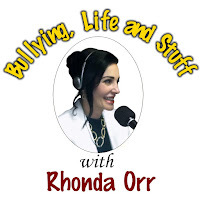 FYI: Go to our website for more information on bullying, life and stuff.